E-Run is the data collection application within E-Prime (E-RUN: E-Run Interface ). When an E-Prime experiment is generated, E-Studio converts the experiment specification (*.es3 file) from the objects specified in E-Studio to the actual E-Basic script (*.ebs3 file) necessary to run the program (E-RUN: Running ). The experiment script (*..eb3 file) is then compiled so that the computer can interpret the instructions. E-Run is the application which processes the code in the .eb3 file in order to run the program and collect data. E-Run may be launched using the Run tool button on the toolbar or through the E-Run command on the E-Run menu in E-Studio. 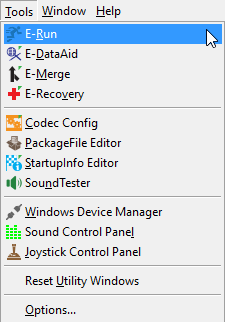 The experiment can be pulled up and run through the E-Run command in the Tools menu in E-Studio, or via the E-Prime menu from the Start menu. Occasionally, when running an experiment you may have to terminate the test session early. E-RUN: Terminating an Experiment  dicusses two different methods for terminating an experiment when using E-Run. To create a shortcut to launch an experiment from using E-Run, please refer to E-RUN: Experiment Shortcuts . For help on any errors generated by E-Prime that you may encounter when using E-Run, please view E-RUN: Error List .